Now with new packaging and contents, designed to reduce waste and single use plastic. See 'Items Included' for more info. The Pacato plug is comfortable, completely discreet and offers the most natural sound of any generic fit earplug in its class. With Pacato you can hear what you need to hear with all the clarity that you’re used to and easily converse and communicate without putting your hearing at risk. 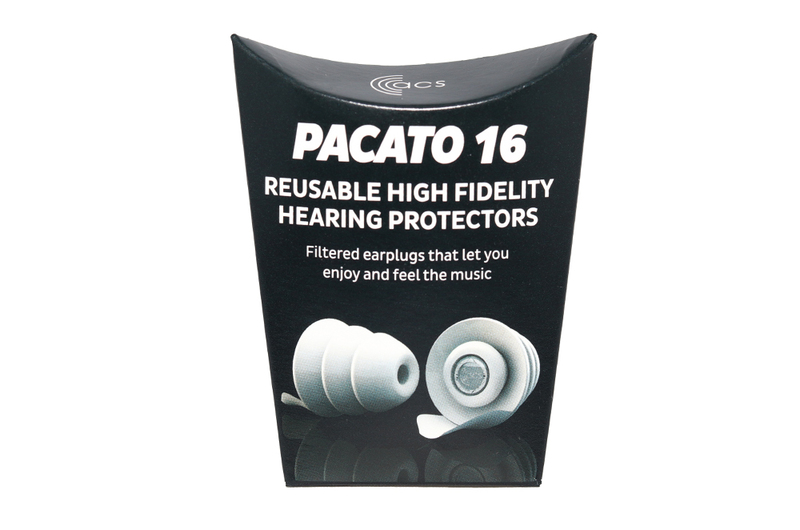 Offering an average of 16dB protection the Pacato is suitable for use in most amplified music or other loud noise environments keeping your hearing safe from damaging exposure to excessive noise but ensuring that you stay involved in the performance. Using Pacato earplugs you can enjoy your music at a level that suits you without losing the fidelity of the sound as you might with foam earplugs, in addition, the Pacato keeps all the atmosphere allowing you to hear what’s going on around you and communicate clearly with others so you don’t have to feel isolated from the music, the atmosphere or the people to keep your hearing safe from harm. We have re-designed the packaging and re-thought the contents of our Pacato ear plugs. To reduce waste we have removed some of the spare items which were not always used, and we have also swapped the imported plastic box for a locally sourced and recyclable cardboard box to reduce single use plastic. This has also allowed us to reduce the price by more than 25%. Download the Pacato specification sheet.